We've seen what NETGEAR has to offer in AC1750 and AC1600 class routers in the reviews of the R6300 and R6250. 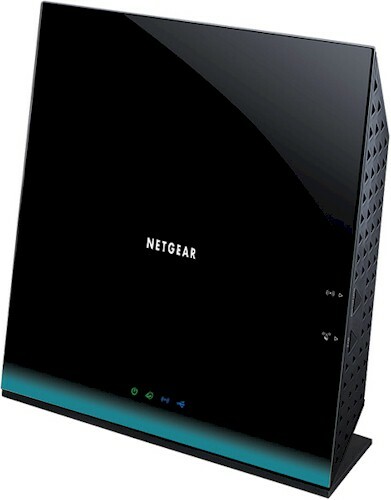 This time, our attention is turned to the only NETGEAR AC router so far to be demoted to its "High Performance" router category vs. the "Ultimate Performance" category where its cousins reside. As befits its lesser performance, the R6100 is physically smaller than the R6250, measuring 7" wide and 6.75" tall to the R6250's 7.5" wide and just shy of 8" tall. Aside from its size, you would think that you had an R6250 in your hands, with its upright stance and similar design features. It has same backlit icons shown in the diagram taken from the R6250's user manual below—the R6100's is not yet available. Like the R6300 and R6250, the R6100 has only power, Internet, Wireless and USB status indicators on the front panel and no link or activity indicators for wired network traffic on either the front panel or Ethernet rear panel WAN or LAN ports. The rear panel diagram below shows a sole USB 2.0 port and subtly identifies the single WAN and four switched LAN Ethernet ports as "Fast" aka 10/100 Mbps. As we'll see when we get to performance, this design choice may severely limit this product's appeal. It seems that everyone is now having the FCC delay the release of internal photos. So I got out my trusty Torx set and opened up the R6100 for photos. Taking off the front cover reveals a view similar to the R6250's. Unlike the TRENDnet TEW-811DRU, the R6100 has four single-band antennas; two for each radio. The shielding tape partially covers the flash memory. NETGEAR again mounted its "Patent pending" circuit board antennas on a removable frame. This view has the board and antennas removed from the case. Not much to see here with those pesky shields blocking the view. The shields came off with a little effort, rewarding us with our first view of a draft 802.11ac router based on Qualcomm Atheros chipsets. The large device is an Atheros 9344 802.11n 2x2 dual-band router SoC. This handles the 2.4 GHz radio, main CPU, Ethernet and USB 2.0 functions. It's the main reason why the router has 10/100 ports and has an aggressive $100 price. It has a thermal pad on it that couples it to the RF shield cover. There are two small devices in the shielded area to the left, but the numbers on them didn't reveal what they were. The smaller device to the left of the photo is the 5 GHz radio in the form of a QCA9882 2x2 802.11ac/a/b/g/n radio with two Skyworks SE5003L 5 GHz power amplifiers. It also is thermally coupled to its RF shield via a thermal pad. 128 MB of RAM and flash finish up the design. Table 1 includes the R6250's key components for comparison.